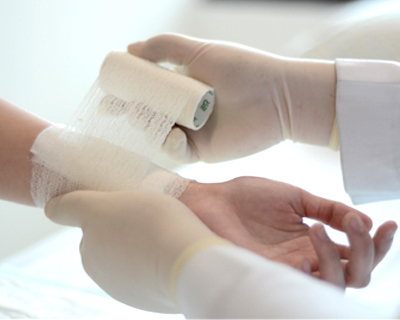 The Wound Care Center is dedicated to providing comprehensive and personalized management of all types of wounds from the simplest to the most complex. With its roster of competent and compassionate specialists, the Wound Care Center aims to deliver comprehensive and holistic wound management. Adhering to the highest standards in wound care management, the Center’s specialists are mostly trained abroad, board-certified plastic and reconstructive surgeons. Nurses also undergo continuous training to improve skills relevant to the care of wounds. The center also carries a complete line of wound care supplies that is at par with hospitals abroad. The launching of Tissue Analytics– a mobile app that revolutionizes wound care management–provides rapid method of monitoring and documenting of patient’s wounds, whether diabetic wounds, chronic wounds, pressure ulcers, traumatic wounds, burns and other complex wounds. These are objectively and digitally measured for evaluation, tracking, managing and progress monitoring. Manila Doctors Hospital’s Wound Care Center specialists using Tissue Analytics App are committed to improve patient care with an innovative approach to wound care management. With this tool, patients are confident of receiving comprehensive assessment, management, monitoring as well as an enhanced continuity of care which results to better clinical outcomes.